The North Portsea Island Scheme involves the replacement of 8.4km of coastline protection of low-lying land in the city of Portsmouth. Predictions indicate that sea levels are set to rise by up to a metre over the next 100 years, which significantly increases the flood risk to nearly 9,000 homes, 800 non-residential properties and critical infrastructure. 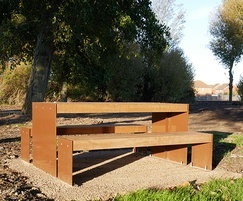 The flood defences at the Tipner Lake phase of works comprises vertical sea walls and landscaping works to enhance the natural amenity of the surrounding area. These are concentrated along the coastal fringe of Alexandra Park, which itself is home to the Mountbatten Leisure Centre, Portsmouth Athletic Club track and Portsmouth Gymnastics Centre. A tarmac shared cycle and footpath runs behind the concrete sea defence wall, providing traffic-free links to the city centre. 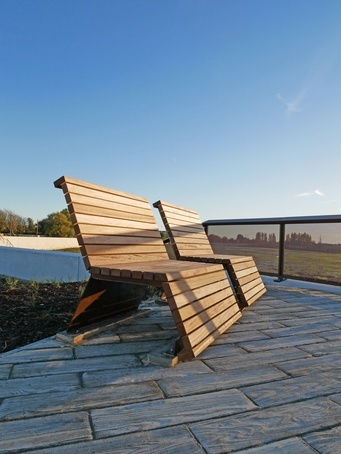 In two areas, levels have been locally raised so that seating can be set at wall-top height, allowing people to take time to enjoy the panoramic views out over the lake and to the Portsmouth city skyline beyond. 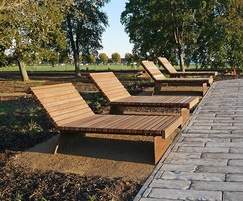 Several different forms of seating were required, including conventional seats and benches, picnic tables and loungers, in both relaxed and upright forms. 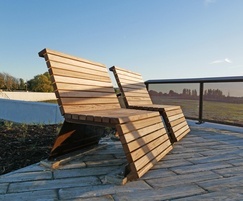 Furnitubes’ Elements seating range was chosen for the basic seating, with other bespoke products designed to complement in their proportions and detailing, and material sizes and finishes. 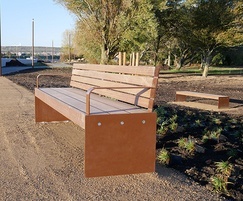 For the aggressive weathering conditions at this marine location, all steelwork was hot-dip galvanised and polyester powder coated in a corten-effect finish, with a further anti-graffiti coating applied to meet the expected tough demands of an area that has a history of vandalism. 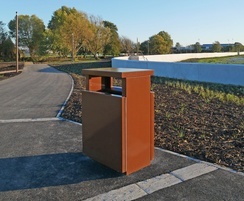 The other product in this co-ordinated suite was a bespoke version of the Caledonian litter bin, designed with a reduced size litter aperture to discourage seagulls from foraging inside.